Recently, DCWaites sent me a sample of Faux Parker Penman Sapphire #9, and a matching sample of the real Parker Penman Sapphire. I inked up a MB 149 on loan to me from fellow FPNer, Steve D. I then wrote 40 pages for this CRV. Sign up here for one of the 40 spots. Send $5 to Sinistral1 as a GIFT to cover the shipping costs. Be sure to send your address so that I know where to send the package. 1 Sample of Blue ink - NOT PPS. 1 Paper with my writing sample of PPS. 1 Postage Prepaid return label. You write or doodle with the blue that I send you and any other blue inks you want. Scan or photograph your comparison sheet and then mail the original back to me in a regular envelope. The remaining ink and sheets are yours to keep. Though you can feel free to send back the sheets with doodles for other CRVs. 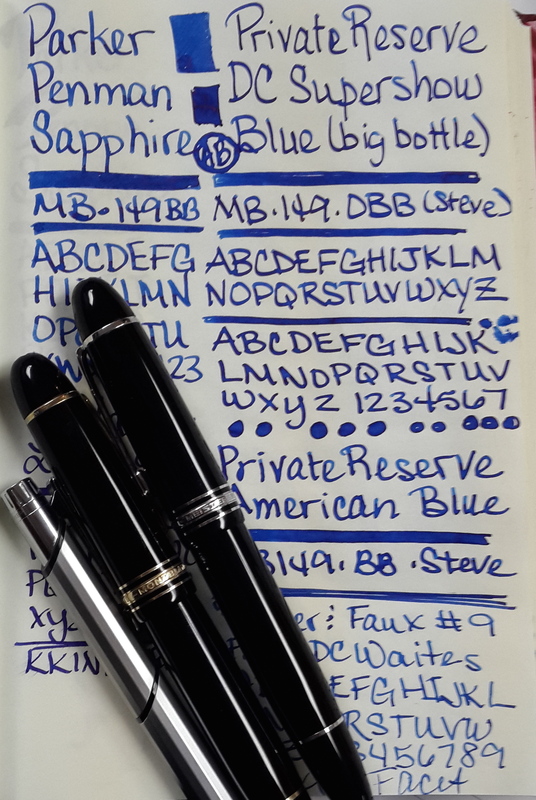 The goal is for us to compare at least 40 different Blue inks to the grail ink - PPS. OH - we can do this a different way too. If you aren't in the CONUS or you have lots of blue ink, then send Sinistral1 $1.25, and you choose your own ink. 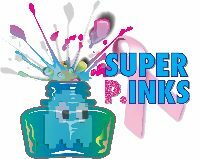 Let us know what ink that will be. I'll send you the 5 sheets of paper (1 with the writing sample). You pay for return postage on the sheet. Amberlea - I'll sign up for the second option. 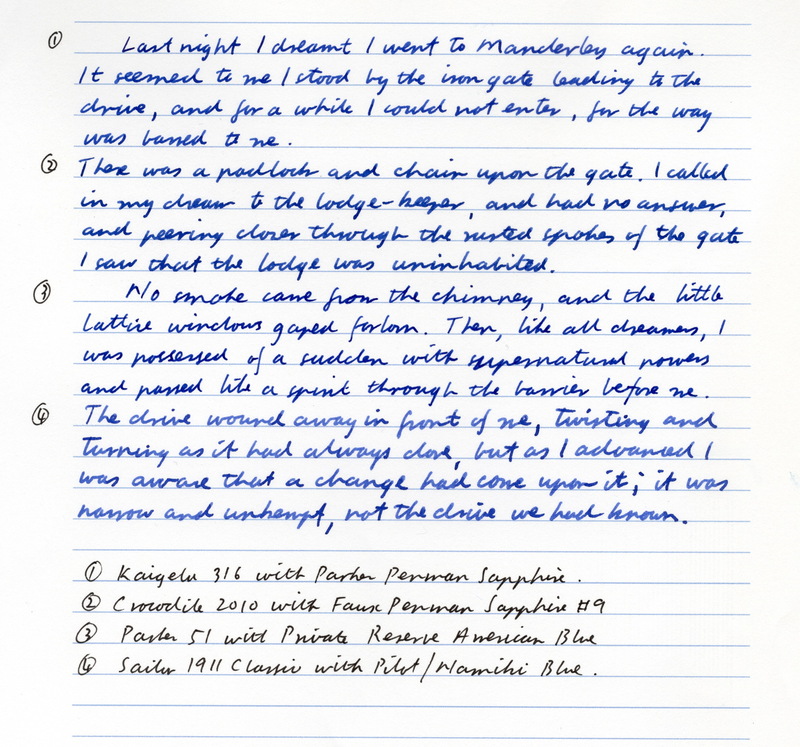 I have lots of blue ink, and I once had a sample of PPS (the real thing). Plus I made a batch of faux PPS #9 from the recipe. But I'm really curious as to how my ink compares to what you have, so this looks like an ideal way for me to play. Especially since some of your scans have given me some ideas that suggest other inks may also compare well with PPS. And for that I need a sheet with some of the real thing put down on it! I will send the 1.25 by Paypal tomorrow. Woo Hoo. I am so excited! The paper is Double A white copy paper, which is available in Aus, and a number of places in the US, as well as South East Asia (it does come from Thailand, after all). If you want some, Amber, let me know and I will send a few sheets along with the original sample. As usual, click on the image to get a large-size view. PS, I was watching the film 'Rebecca', and this inspired me to use the first couple of paragraphs of the novel for my sample. That opening sentence is just welded into my brain. I don't know why. Edited by dcwaites, 11 July 2015 - 11:59. The first three are so close together, at least in the scan they are. And frankly, I think the American blue is an even better match than the faux #9 - I am going to test it out today to see if that holds up in real life... Thanks for the writing samples! and thanks for the faux PPS, it's a really nice ink. Wow, I could only tell that the Pilot wasn't vibrant enough. And your paper is off to visit the world. Your paper is on it's way too! So far - two contenders - DCWaites of course started this adventure so he may end up being the final judge. Looking forward to the comparisons... I may make up a new faux #9 batch and see how well it fares with being stored! In addition to the other blues. DCWaites of course started this adventure so he may end up being the final judge. I have lots of blue inks so I am in. Let me paypal her right now. Payment sent. Edited by fireant, 13 July 2015 - 19:35. I don't have many blues but I have the real deals (samples) so I am in but I don't need more samples sent!